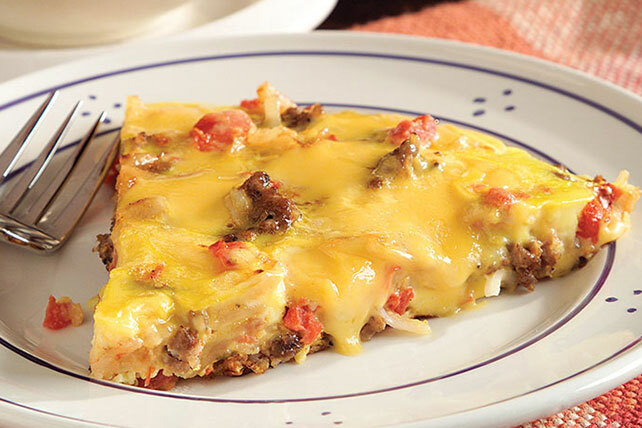 Why make a plain-Jane omelet when you could make this Hearty Sausage Skillet with shredded hash browns and melted VELVEETA®? Brown sausage in large ovenproof skillet sprayed with cooking spray on medium heat; drain. Return sausage to skillet. Add potatoes and tomatoes; stir. Cook 5 min. ; stir. Top with VELVEETA. Whisk eggs and water until blended; pour over ingredients in skillet. Bake 20 to 25 min. or until egg mixture is set in center and VELVEETA is melted. Let stand 5 min. before cutting to serve.